Each winter the snow gods smile on Helena’s Bill Roberts Golf Course for just a few glorious weeks, and we enjoy enough snow cover in town to ski where Charles Lindbergh landed his Spirit of St. Louis in 1927. 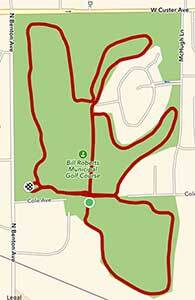 The Last Chance Nordic Ski Club, in partnership with the City of Helena’s Parks and Recreation Department, grooms approximately four kilometers of skate and classic track (map) around the perimeter of the golf course. The route of the groomed tracks is changed year to year, but the tracks typically run together across the gently rolling terrain. Skiing is free, and all skiers are welcome. Parking for the Golf Course is located at 2201 North Benton Avenue, which is immediately east of Benton Avenue, two driveways north of the railroad tracks. If you are snowshoeing, walking your dog, on a fat-tired bicycle, or on foot, please avoid the groomed ski tracks as well as the Golf Course’s tees and greens. For trail use suggestions, see the LCNSC’s Trail Use Guidelines. In recent years, stalwart club volunteers Dave Dalthorp and Doug Compton have done the lion’s share of the Golf Course grooming. If you wish to help defray the cost of grooming, the Club welcomes your membership and would be grateful for your donation. 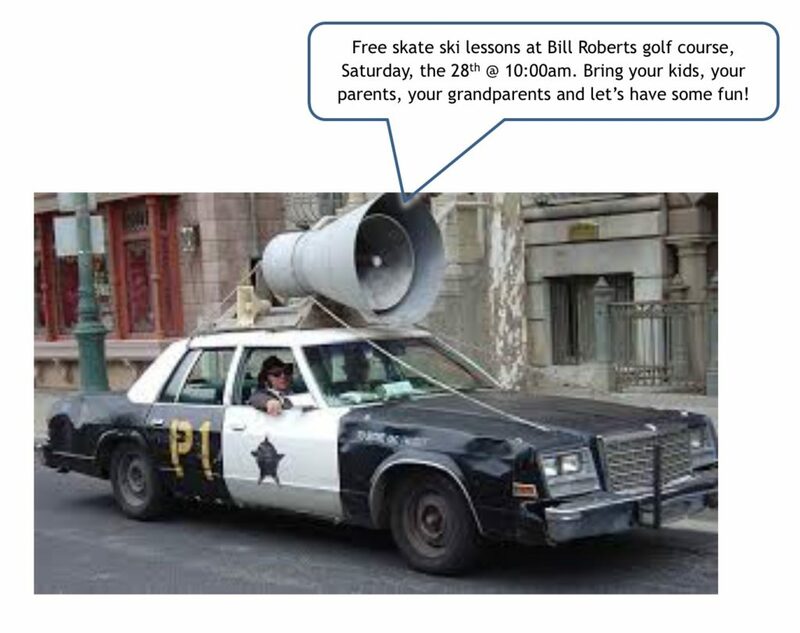 Have a great time skiing, and in Lindbergh’s footsteps, swooping around Helena’s Bill Roberts Golf Course. The skate lane was refreshed last night. Skiing should be good today! Skate lane tuned up last night. Never mind the hole where Dan got stuck! “That triumphant feeling when you learn and conquer a new sport and feel amazing about yourself…this is what these powerful, positive girls experienced yesterday. 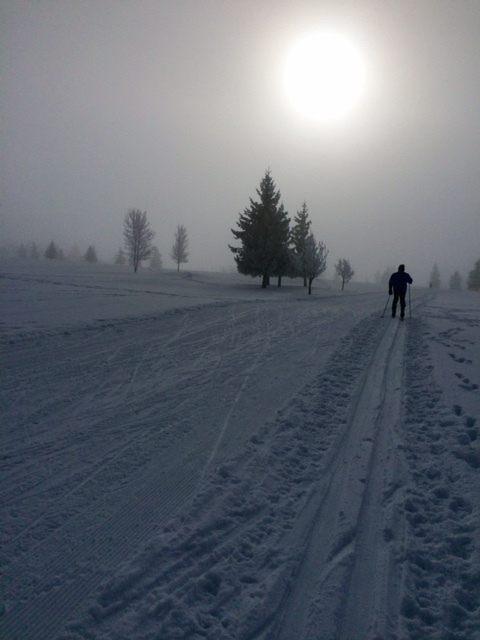 Cross-country skiing takes a lot of grit, resilience, and courage to get back up and keep trying! We couldn’t be more proud and thankful. Thankful for our amazing partnership with The Base Camp(shout-out especially to Tim Lynch and Les Mignery!) for donating and organizing the ski set-ups, thankful for Carl & Andree Anderberg for generously taking time out of their busy days to instruct us (and bring us cookies! Anderbergs FTW our amazing and helpful coaches Karla Clark & Kessa Franklin, Last Chance Nordic Ski Club for grooming the beautiful golf course trails [thanks Dave and partners!] and allowing us access to this incredible facility, and Shalon Hastings, owner of Hub Coffee for donating yummy hot cocoa! So much [love] and gratitude for these supportive people! One year after the first Women’s March, I can’t help but be proud of Helena for providing opportunities for these girls and young women to experience themselves as strong, competent outdoors people. Great stuff. I encourage you to go to their Facebook page and look at the pictures. You’ll be inspired. You too will be proud to be living in Helena. Plus…we all should be having this much fun! Ellie and Sue on LeGrande Cannon, west of Silverette Street. LeGrande is skiing pretty well (in a backcountry way; skating would be horrible for skater and walkers alike). In places my poles bottomed out in gravel, but my skis floated safe and sound in pretty nice snow. There’s parking at Silverette and LeGrande. LeGrande can’t rival Dave’s lovely grooming on the Golf Course, but it’s not often that we get to ski this popular local walking path. Enjoy! The LCNSC will host its second beginners skate ski class of the season this Saturday January 23 at 12:00 pm at Bill Roberts Golf Course. As of today, the golf course is in good shape still thanks to our groomers and the inch or so of fresh snow on top of a solid base. 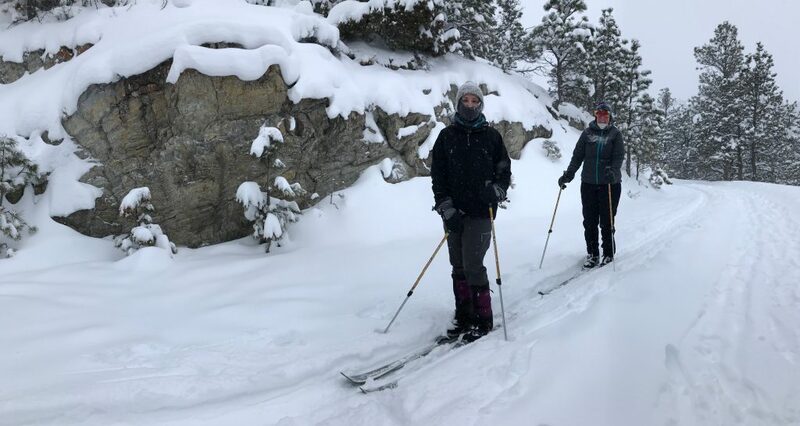 We’ll plan on breaking into groups and working on the basics of skate skiing including balance, gliding on one ski, weight shift, and poling. So far we have 4 instructors for the class. Prior cross country or downhill skiing experience will be useful for learning to skate ski. Please spread the word if you know of someone who is interested in attending. The forecast looks a little warm this week, so we’ll hope the snow at the golf course holds out. Also, if you need rental equipment, the Base Camp has a good selection. See you on Saturday!